You all know that I serve my family a simple, allergy-friendly whole food diet with lots of fresh produce for $1 per person per meal. You also know that we are a family of 6 – with 4 kids aged 6-18. We consume A LOT of food in our house!!! Most of the strategies that I use involve BULK! Bulk shopping and bulk cooking. If you are a household of 1 or 2 people, you may feel like my strategies to save time, money, and energy on a whole food diet don’t apply to you. Many of my readers are facing retirement, experiencing an empty nest, or are happily single. I know you’re wondering if my teachings are relevant. I am here to tell you that, with a few adjustments, all of my teachings can be applied to you! So, let’s dive in. How can you, with a family size of 1 or 2, apply the teachings that coming out of Dinner for a Dollar HQ? 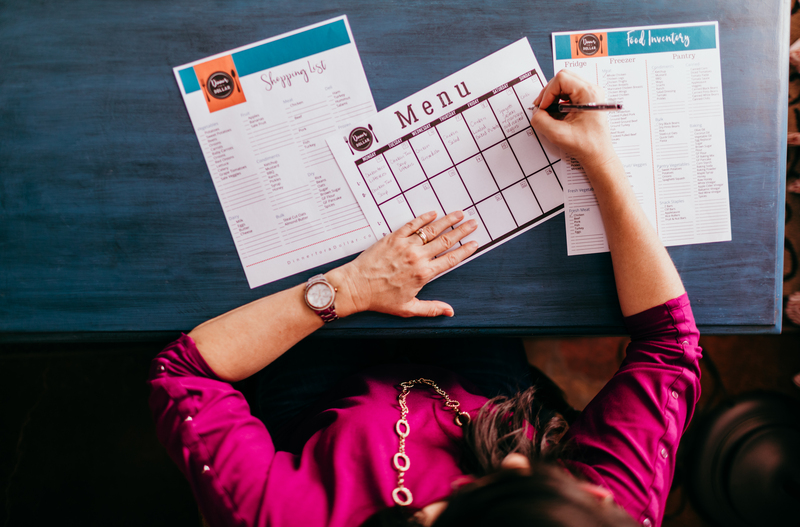 If you have a smaller household, there are 4 ways you can apply the teaching from Dinner for a Dollar to your family. If you have been around any time at all, you will know that pretty much everything I teach starts with proper planning. Whether you have a family of 1 or 100, you will not be able to eat a whole food, produce-rich diet on a tight budget and a tight schedule without a good plan. Family size does influence the types of issues you need to plan for. With a family size of 1 or 2, in order to reduce waste, you really need to plan for proper portions. To do this, I recommend that you create shopping lists that are very specific. On your list, quantify the amount of items you need. For instance, rather than writing “onions” on your grocery list, write exactly how many onions you need. You also need to invest in pans suited to the portion sizes you are planning to cook. If you plan to cook meals suited for 1 or 2, be sure to choose the proper pan size – standard 9x12 baking dishes are way too big. A 9x9 pan or even a bread loaf pan might be more appropriately sized for you. If you adjust the pan size, be sure to adjust your cooking time as well! However, if you’re planning to freeze those extra portions (more on that in a minute), you can plan to stick to more traditional pan sizes. Your freezer is your friend – you need to fall in love with that bad boy. It will be one of the main tools you will use to meet the needs of your smaller household on a tight budget. How can a smaller household use their freezer to help hit their food and financial goals? It’s simple – divide and freeze. Make double, triple, quadruple your portion sizes and freeze the meals in individual portions. Over time, your freezer will be filled with a strong variety of individual meals that you can pull out to heat and serve. You also can double, triple, or quadruple core ingredients and freeze those in individual sizes. For example, you can freeze pre-cooked rice, chicken broth, beans, or any types of meats. Then, when you’re ready, you can use those pre-cooked core ingredients as the base for quick mid-week meals. **Hint hint…this is my number 1 whole-food time-saving hack! Check out this blog post for more details and tips! To do this, you may need to invest in individually sized freezer storage containers. Here are some examples of some options that can work for you in (affiliate links) plastic, aluminum, and glass. Plan for meals that will allow you to repurpose your leftovers – rather than just reheating them. Most people don’t enjoy reheating the same meal over and over again. But, if you can find a way to repurpose your ingredients into new, fresh, distinct meals throughout the week, you will save time and energy in the kitchen. So, what do I mean by re-purposing your leftovers? To show you what I mean, lets start with a simple chicken breast. Maybe a serving size for you, in your home, is 1 chicken breast. Most packages come with 4-6 chicken breasts. You can either pull out 1 breast and freeze the others OR you can cook them all and use them in distinct meals throughout the week. Let’s say you cook 6 chicken breasts. I recommend you take 3 of them and put them right into the freezer. Then, next week, you will have the protein for 3 meals pre-cooked. Then, this week, you take those 3 chicken breasts and create 3 distinct meals – you can make chicken salad for a chicken salad sandwich, a chicken and rice soup, and a green salad topped with a grilled chicken breast. The following week, you can make chicken tacos, a chicken quesadilla, and a loaded baked potato topped with chicken breasts. So, rather than reheating the same leftovers over and over, you have taken a core ingredient – in this case, a chicken breast – and turned it into 6 distinct meals. 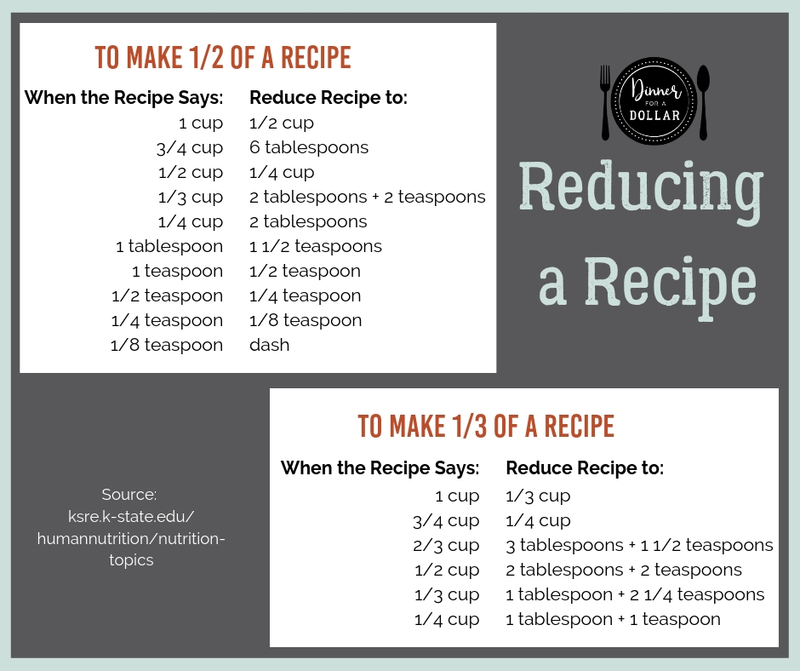 If you don’t want to cook a full recipe and freeze the remainder, you need to learn how to cut recipes down to the number of portions you want to cook. Now, of course, you can reduce those fractions in your head. But, if that isn’t your jam, there are some great online resources to help you! Let’s all take a moment of silence and thank Al Gore for inventing the internet so we don’t have to reduce our own fractions anymore. This site will reduce (or increase) any recipe you want! You just need to know the recipe, the original serving sizes, and the amount of servings you want to make. Once you input that data, it automatically recalculates the recipe for you. It’s super handy! AllRecipes is a site I use a lot for finding great recipes. They have a feature that allows you to search for recipes based on a specific ingredient. I frequently use this when I have a specific ingredient that I need to use up. You probably already know that about Allrecipes. But, what you may not know, is that they also have a feature where you can adjust the serving sizes of EVERY SINGLE RECIPE in their system!!! You can adjust them from 1 – 100+ servings. Hopefully this gave you some ideas for how you can serve your smaller household a whole food diet on a tight budget and a tight schedule. 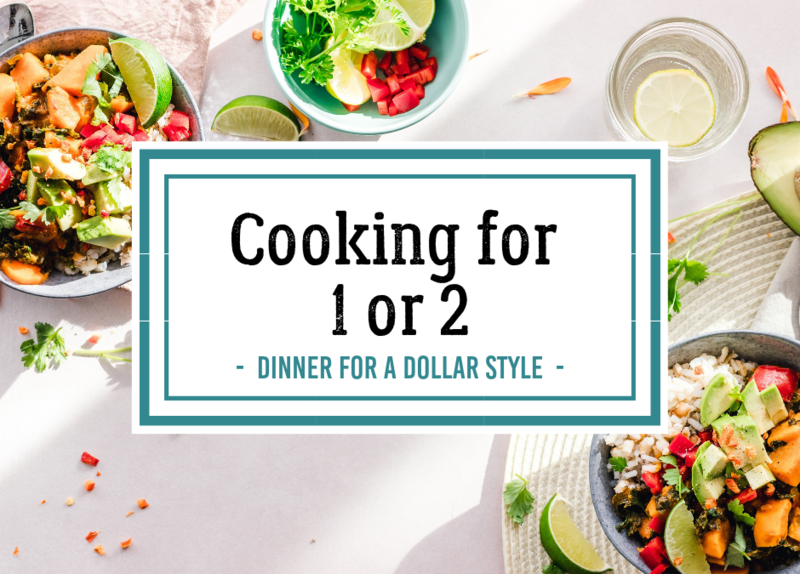 With a little bit of planning, freezer hugging, repurposing, and reducing, you can serve your family of 1 or 2 Dinner for a Dollar.